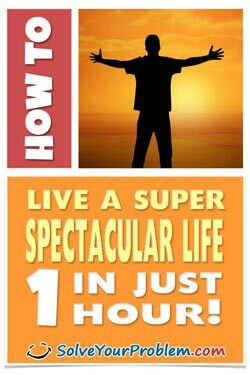 Album: Success-Happiness How To Live A Super Spectacular Life In Just 1 Hour! No matter what you do in life, doing it well reaps great rewards. Whether this concept is applied to your work or your health, your relationships or your personal goals, making a commitment to personal excellence in whatever you do virtually guarantees a life of fulfillment, success and passion. One common reason people don't give their best effort is because they don't believe they are capable of more. Does this describe you? Are you more focused on getting quick results, even if they aren't the best results? Do you think that if a task requires too much effort it won't be worth it? Do you consistently avoid working any harder than you have to? Do you believe that massive success is only for the truly talented and lucky, so there's no point in giving your best? If you're like the average person, you are probably capable of 20 times more than you have achieved so far. If you are willing to just CONSIDER that you're capable of more, you are in the right mind-set & about to change everything you ever knew. Download my very inspiring and easy to master guide today!